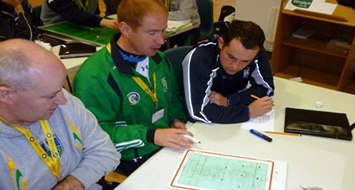 The Ulster GAA Coach Education Programme is in full swing with an Award 2 Child Course completed on Saturday 3rd November and an Award 2 Youth/Adult Course completed on Saturday 17th November. Both courses were delivered by the Ulster Senior Tutor Group and were well received by the participant coaches. The emphasis was on thinking coaches nurturing thinking players. Hopefully this approach will empower the next generation of club and county players to raise the bar yet again in Ulster and to deliver more winning performances.